Wroxham Station is home to Buffer Stop Books which has over 5,000 pre-owned books for sale and a wide selection of records, CDs and DVDs. Drop in for a coffee and browse through some of the many books we have to offer. Joined the vinyl record resurgence? See our collection of pre-owned records in different genres. The shop is run entirely by enthusiastic volunteers of the Friends of the Bure Valley Railway. All the sale proceeds go to fund projects to enhance the railway’s operation and visitors’ experience. At Aylsham there is a shop run by volunteers of the Friends of the Bure Valley selling a wide array of pre-owned items from railway memorabilia to children’s toys. Books, Jigsaws, Good Bric-a-Brac, Games, DVDs, CDs, LPs, Die Cast Models, Knitting and Dress Patterns, Railway Memorabilia, Postcards, Anything to do with Model Railways and Thomas the Tank Engine items. 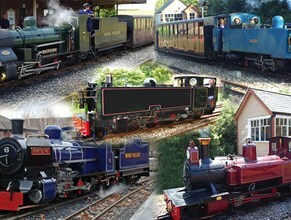 All donations go to help support the railway! The volunteers of Bufferstop Books and Trackside Treasures would like to wish you a Happy Christmas and a Happy New Year, and thank you for your help and support in 2018 and look forward to seeing you again in 2019.